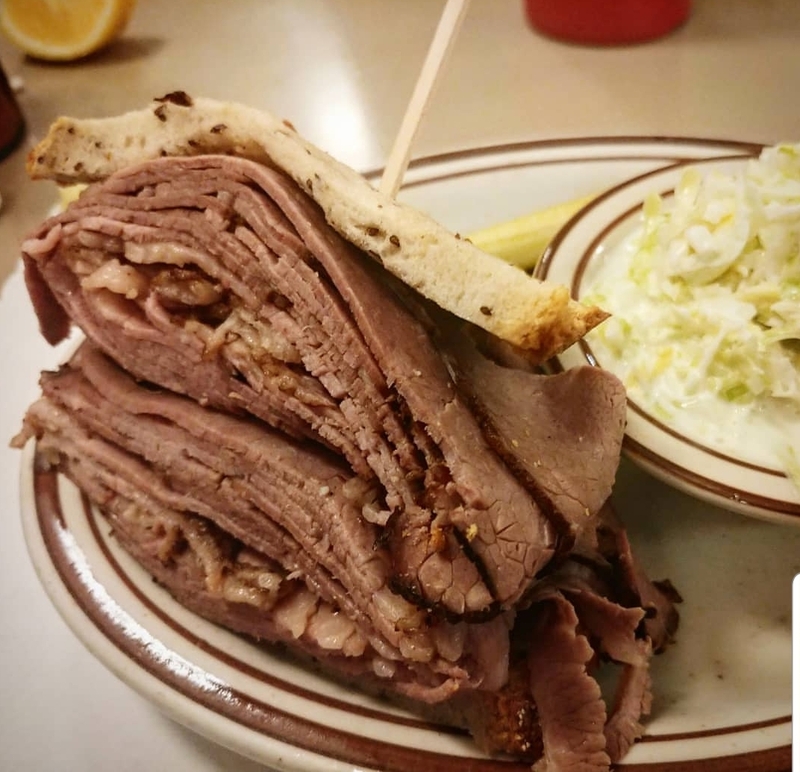 Blintzes, corned beef sandwiches & matzo-ball soup are menu highlights at this old-fashioned deli. With chicken pieces and carrots. Served with crackers or bagel chips or bread and butter. 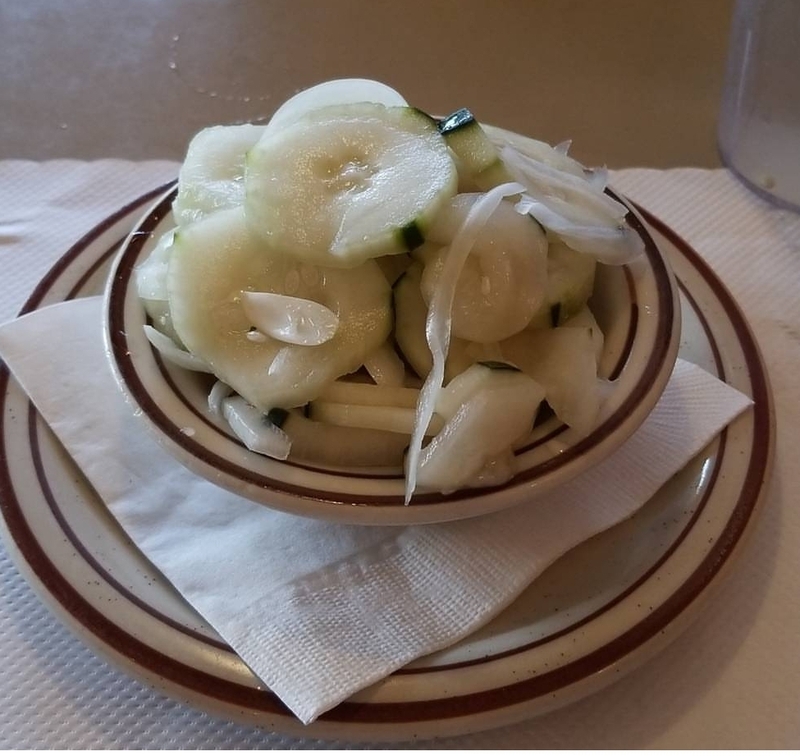 Fresh or sauteed Onions. Served with hash browns, tomato or fresh fruit and bread, bagel or roll with butter or cream cheese. All sandwiches on rye (unless otherwise specified). Served with potato salad or cole slaw or fresh fruit. Pancake-style. Served all day. Served with hash browns, tomato or fresh fruit and bread, bagel or roll with butter or cream cheese. Served on a bagel with tomato and onion. Served with hash browns, tomato or fresh fruit and bread, bagel or roll with butter or cream cheese. Choice of lox, whitefish or baked salmon. Substitute cod or sturgeon, add $4.00. Served with hash browns, tomato or fresh fruit and bread, bagel or roll with butter or cream cheese. Pancake-style. Served with hash browns, tomato or fresh fruit and bread, bagel or roll with butter or cream cheese. Served all day. Served with hash browns, tomato or fresh fruit and bread, bagel or roll with butter or cream cheese. Certified Angus beef tri-tip steak and two eggs any-style. Served with hash browns, tomato or fresh fruit and bread, bagel or roll with butter or cream cheese. One egg any-style, two slices of bacon. Served with hash browns, tomato or fresh fruit and bread, bagel or roll with butter or cream cheese. Eggs, ground beef, fresh onions, spinach and Parmesan cheese. Served with hash browns, tomato or fresh fruit and bread, bagel or roll with butter or cream cheese. Ham, onions, bell peppers and pineapple ring. Served all day. 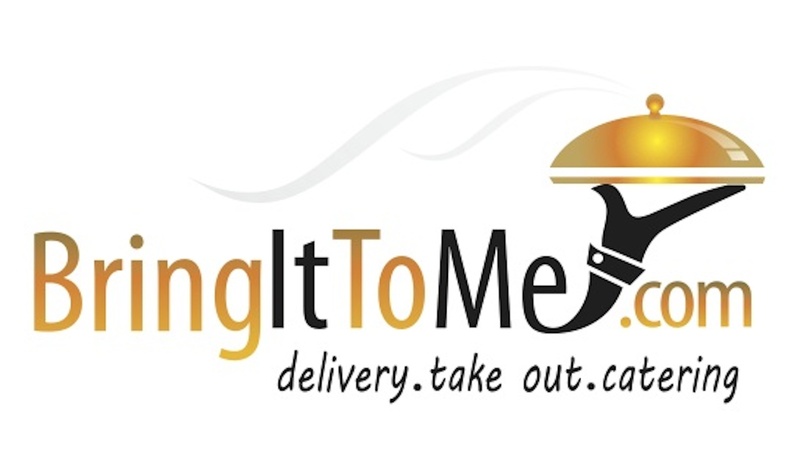 Served with hash browns, tomato or fresh fruit and bread, bagel or roll with butter or cream cheese. Green chile, muenster cheese and Spanish sauce. Served with hash browns, tomato or fresh fruit and bread, bagel or roll with butter or cream cheese. Pancake style. Mushrooms, broccoli, zucchini, cauliflower, fresh onions and tomato. Served with hash browns, tomato or fresh fruit and bread, bagel or roll with butter or cream cheese. Pancake style. 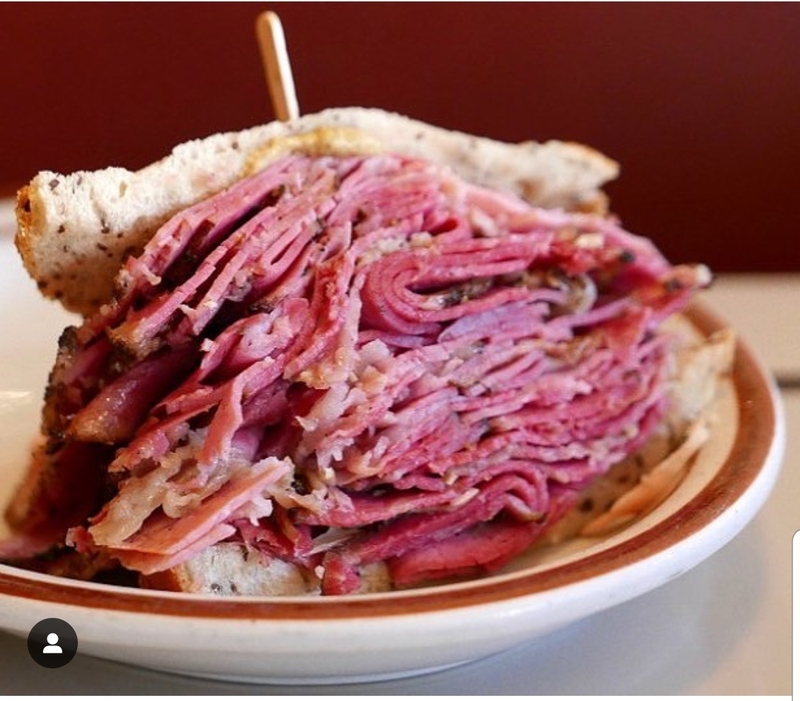 Corned beef, pastrami and salami. Served all day. Served with hash browns, tomato or fresh fruit and bread, bagel or roll with butter or cream cheese. Create Your Own Omelette. Served with hash browns, tomato or fresh fruit and bread, bagel or roll with butter or cream cheese. Lox, Whitefish or Baked Salmon. Choice of 2. Substitute Cod or Sturgeon ADD 3.00. Served on a bagel with tomato and onion. Hand sliced. Served with cream cheese, cole slaw, onion, cucumber, tomato, olives and two bagels. Served with cream cheese, cole slaw, onion, cucumber, tomato, olives and two bagels. Choice of two: lox, whitefish or baked salmon. Substitute cod or sturgeon add $5.00. Served with three bagels. Served with cream cheese, cole slaw, onion, cucumber, tomato, olives and Three bagels. Served with raisins, brown sugar and milk. Served all day. Egg, bacon, bell pepper, fresh onions, tomato and Cheddar cheese wrapped in a flour tortilla with salsa and sour cream. Two eggs sunny side up on corn tortillas, Spanish sauce, Cheddar cheese with hash browns. Fried egg, bacon, Cheddar cheese on an English muffin. Served with fresh fruit. Two poached eggs and Canadian bacon on an English muffin. Topped with Hollandaise sauce. Served with hash browns. Two poached eggs and spinach on an English muffin. Topped with Hollandaise sauce. Served with hash browns. Two poached eggs with lox on potato pancakes, topped with Hollandaise sauce. Served with hash browns. Served with butter or cream cheese. With tomato and onion add $2.50. Regular or dollar size. Served with whipped butter and syrup. One egg, any style, two pancakes and two slices of bacon. Served with whipped butter and syrup. Served with cottage cheese, bread or bagel or roll and butter or cream cheese. Served with bagel chips or bread and butter or cream cheese. Pastrami and corned beef or vegetarian with avocado and tomato. Served on potato pancakes. Rare roast beef, turkey, American cheese, hard boiled egg, lettuce and tomato. Served with choice of dressing, bread and butter or cream cheese. Chicken, bacon, Bleu cheese, mushrooms, avocado, hard-boiled egg, lettuce, tomato and peas. Served with choice of dressing, bread and butter or cream cheese. Chicken, lettuce, scallions, water chestnuts, mushrooms, mandarin oranges, noodles, pea pods with side of honey mustard dressing. Served with choice of dressing, bread and butter or cream cheese. Chicken, bacon, grated egg, red onion, croutons and spinach. Served with choice of dressing, bread and butter or cream cheese. Flaked tuna, lettuce, hard-boiled egg, Greek olives, tomato and onion. Served with choice of dressing, bread and butter or cream cheese. Turkey, avocado, scallions, beets, carrots, celery, cucumber, lettuce and tomato. Served with choice of dressing, bread and butter or cream cheese. Turkey, salami, Swiss cheese, garbanzo beans, tomato, olives, pepperoncini, Parmesan cheese and lettuce. Served with choice of dressing, bread and butter or cream cheese. Ground beef or chicken, refried beans, Cheddar cheese, lettuce, avocado, tomato, olives, sour cream and salsa in a fried tortilla shell. Served with choice of dressing. Certified Angus beef tri-tip, on a bed of field greens with Bleu cheese, walnuts, beets, red onion, red cabbage and tomato. Italian dressing served on the side. Served with choice of dressing, bread and butter or cream cheese. Grilled Alaskan salmon filet, on a bed of field greens with scallions, snap peas, carrots, red onion, red cabbage and tomato. Honey mustard dressing served on the side. Served with choice of dressing, bread and butter or cream cheese. Served with choice of dressing, bread and butter or cream cheese. Corn, cucumber, red onion, radishes, lettuce and tomato. Served with choice of dressing, bread and butter or cream cheese. Zucchini, red onion, mushrooms, broccoli, cauliflower, bell peppers, lettuce and tomato. Vegetarian. Served with choice of dressing, bread and butter or cream cheese. Carrots, celery, broccoli, cauliflower, zucchini, cucumber, mushrooms, lettuce and tomato. Vegetarian. Served with choice of dressing, bread and butter or cream cheese. Tomato, Greek olives, cucumber, red onion and Feta cheese on a bed of chopped lettuce with a side of Greek salad dressing. Served with choice of bread and butter or cream cheese. With cottage cheese. Served with bread and butter or cream cheese. Tomato, cucumber, carrots, mushrooms and lettuce. Served with choice of dressing, bread and butter or cream cheese. Served with bread and butter or cream cheese. Tomato, croutons and lettuce. Served with choice of dressing, bread and butter or cream cheese. One scoop each: turkey salad, tuna salad, egg salad with potato salad, cole slaw, tomato and onion. Served with choice of dressing, bread and butter or cream cheese. Rare roast beef, turkey, American cheese, hard-boiled egg, lettuce and tomato. Served with choice of dressing, bread and butter. Chicken, bacon, Blue cheese, mushrooms, avocado, hard-boiled egg, lettuce, tomato and peas. Served with choice of dressing, bread and butter. Chicken, lettuce, scallions, water chestnuts, mushrooms, mandarin oranges, noodles, pea pods with side of honey mustard dressing. Served with bread and butter. Chicken, bacon, grated egg, red onion, croutons and spinach. Served with choice of dressing, bread and butter. Flaked tuna, lettuce, hard boiled egg, Greek olives, tomato and onion. Served with choice of dressing, bread and butter. Turkey, avocado, scallions, beets, carrots, celery, cucumber, lettuce and tomato. Served with choice of dressing, bread and butter. Turkey, salami, Swiss cheese, garbanzo beans, tomato, olives, pepperoncini, Parmesan cheese and lettuce. Served with choice of dressing, bread and butter. Zucchini, red onion, mushrooms, broccoli, cauliflower, bell peppers, lettuce and tomato. Vegetarian. Served with choice of dressing, bread and butter. Carrots, celery, broccoli, cauliflower, zucchini, cucumber, mushrooms, lettuce and tomato. Vegetarian. Served with choice of dressing, bread and butter. With chicken pieces and carrots. Served with crackers or bagel chips or bread and butter. Chicken, carrots or noodles packed separately on side for an extra charge. Served with crackers or bagel chips or bread and butter. Vegetarian soup. Served with crackers or bagel chips or bread and butter. Cold, vegetarian soup. Served with crackers or bagel chips or bread and butter. with Sour Cream. With chopped onions and shredded Cheddar cheese. Served with crackers or bagel chips or bread and butter. 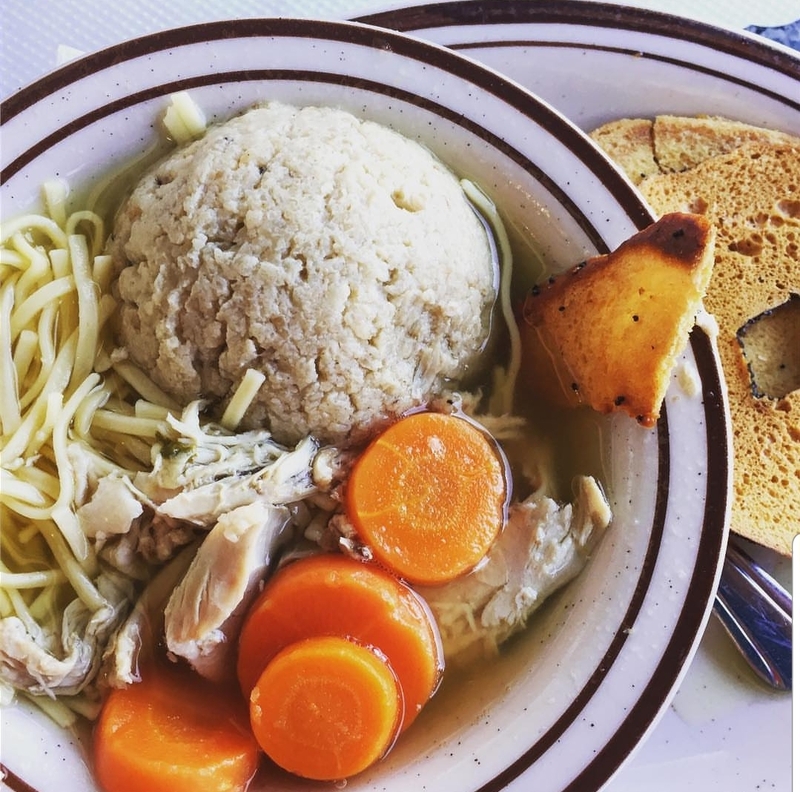 Kreplach, matzo ball, noodles, kasha, rice, chicken pieces, carrots and chicken broth. Served with crackers or bagel chips or bread and butter. Ground turkey or ground beef patty. Served with lettuce, tomato and onion. Served with choice of French fries, sweet potato fries, fresh chips, onion rings, potato salad, cole slaw or fresh fruit. Served with lettuce, tomato and onion on a wheat bun. Served with choice of French fries, sweet potato fries, fresh chips, onion rings, potato salad, cole slaw or fresh fruit. Ground beef patty, bacon and Cheddar cheese. Served with lettuce, tomato and onion. Served with choice of French fries, sweet potato fries, fresh chips, onion rings, potato salad, cole slaw or fresh fruit. Ground beef patty and sliced pastrami. Served with lettuce, tomato and onion. Served with choice of French fries, sweet potato fries, fresh chips, onion rings, potato salad, cole slaw or fresh fruit. Choice of ground turkey or beef Patty, cheddar cheese and grilled onions on grilled rye. Served with choice of French fries, sweet potato fries, fresh chips, onion rings, potato salad, cole slaw or fresh fruit. Served with choice of French fries, sweet potato fries, fresh chips, onion rings, potato salad, cole slaw or fresh fruit. Grilled hot dog, topped with chili and Cheddar cheese. Served with choice of French fries, sweet potato fries, fresh chips, onion rings, potato salad, cole slaw or fresh fruit. Grilled knackwurst with sauerkraut, chopped onions, relish and Swiss cheese on an onion roll. Served with choice of French fries, sweet potato fries, fresh chips, onion rings, potato salad, cole slaw or fresh fruit. On French roll with au jus. Served with potato salad or cole slaw or fresh fruit. Turkey, bacon, lettuce and tomato on toasted sourdough bread. Served with potato salad or cole slaw or fresh fruit. Ham, turkey, salami, provolone cheese, red onion, tomato, lettuce and Italian dressing on the side. Served on a French roll with fresh potato chips. Avocado, cucumber, lettuce, tomato and choice of cheese. Served on wheat bread with a cup of fresh fruit. All sandwiches with choice of bread. Served with potato salad or cole slaw. On a French roll with au jus. Served with potato salad or cole slaw. 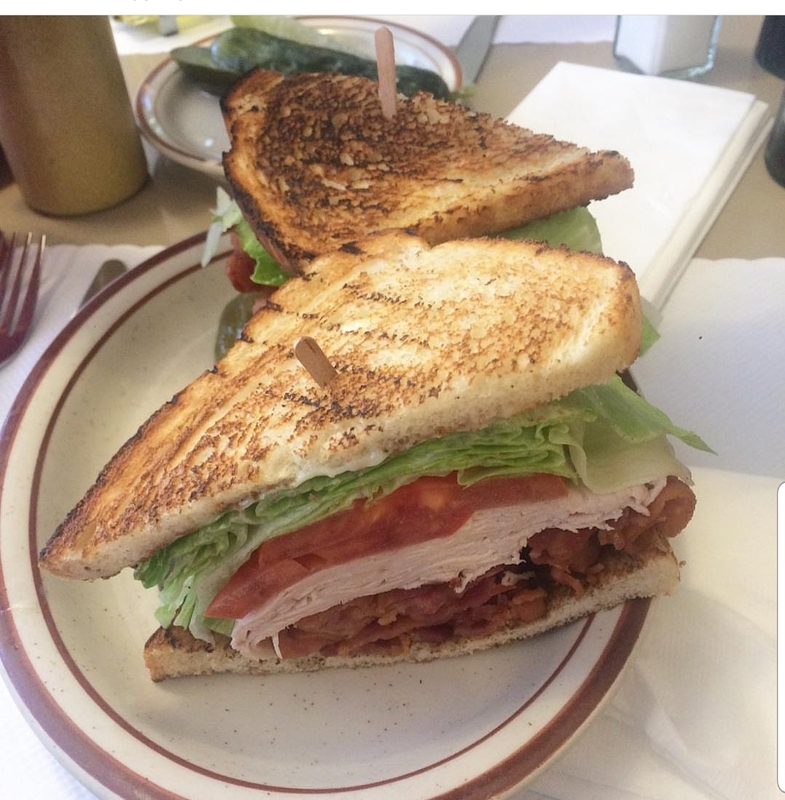 Turkey, bacon, lettuce and tomato on toasted sourdough. Served with potato salad or cole slaw. On egg bread, served with French fries. Topped with cole slaw and Russian dressing on rye bread. Served with potato salad. Choice of turkey, pastrami or corned beef, Swiss cheese. Sauerkraut, Russian dressing on grilled rye with French fries. Pastrami and corned beef, Swiss cheese, sauerkraut and Russian dressing on grilled rye with French fries. Choice of 2: lox, whitefish or baked salmon. Substitute cod or sturgeon add $3.00. Served on a bagel with tomato and onion. Turkey, ham and Swiss cheese. Served on three pieces of bread with potato salad or cole slaw or fresh fruit. Turkey, pastrami and Swiss cheese. Served on three pieces of bread with potato salad or cole slaw or fresh fruit. Pastrami, chopped liver and tomato. Served on three pieces of bread with potato salad or cole slaw or fresh fruit. Rare roast beef, pastrami and Swiss cheese. Served on three pieces of bread with potato salad or cole slaw of fresh fruit. Baked ham, Swiss cheese, lettuce and tomato. Served on three pieces of bread with potato salad or cole slaw or fresh fruit. Corned beef, pastrami and tongue. Served on three pieces of bread with potato salad or cole slaw or fresh fruit. Turkey, corned beef and chopped liver. Served on three pieces of bread with potato salad or cole slaw or fresh fruit. Turkey salad and tuna salad, lettuce and tomato on pumpernickel bread. Served on three pieces of bread with potato salad or cole slaw or fresh fruit. Turkey, bacon, lettuce and tomato. Served on three pieces of bread with potato salad or cole slaw or fresh fruit. Turkey, roast beef and Swiss cheese. Served on three pieces of bread with potato salad or cole slaw or fresh fruit. Turkey, ham and Swiss cheese on sourdough bread. Dipped in egg batter and deep fried with a cup of fresh fruit. 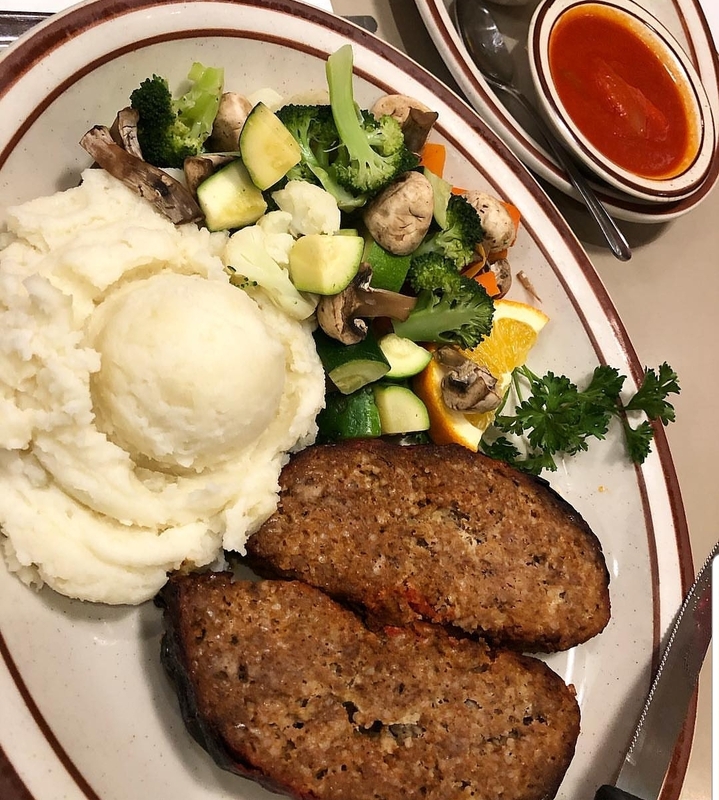 Served open faced on egg bread with stuffing or mashed potatoes and gravy. On egg bread. Served with French fries. Open faced on a kaiser roll with sauce. Served with french fries. Grilled roast beef, onion, mushrooms, melted Provolone cheese on a French roll with onion rings. Certified Angus beef tri-tip steak. Served on a French roll with onion rings. On a French roll with lettuce, tomato and onion. Served with French fries. Breaded fish fillet, Cheddar cheese and tartar sauce. Served on a wheat bun with French fries. Brisket, Muenster cheese, grilled onion on grilled rye with sweet potato fries. Tuna salad and Cheddar cheese on grilled rye with French fries. Potato pancake and vegetable. Served with bread and butter or cream cheese. Mashed potatoes and vegetable. Served with bread and butter or cream cheese. Boiled potato. Served with bread and butter or cream cheese. Potato salad or cole slaw. Served with bread and butter or cream cheese. Potato pancake, applesauce and cole slaw. Served with bread and butter or cream cheese. Boiled half chicken, kreplach, matzo ball, noodles, vegetable and chicken broth. Served with bread and butter or cream cheese. Baked potato and vegetable. Served with bread and butter or cream cheese. Fried half chicken, French fries and coleslaw. Served with bread and butter or cream cheese. Coleslaw. Served with bread and butter or cream cheese. Broccoli, cauliflower, zucchini, mushrooms, carrots and tomato on a baked potato with melted Muenster cheese. Served with bread and butter or cream cheese. Corned beef, pastrami, brisket and Swiss cheese with potato salad and coleslaw. Served with bread and butter or cream cheese. Stuffing or mashed potatoes with gravy and vegetable. Served with bread and butter or cream cheese. Hand sliced. Cole slaw, tomato, onion, cucumber and cream cheese. Served with bread and butter or cream cheese. Cole slaw, tomato, onion, cucumber and cream cheese. Served with bread and butter or cream cheese. Choice of two: lox, whitefish or baked salmon. Substitute cod or sturgeon add $5.00. Served with cream cheese, cole slaw, onion, cucumber, tomato, olives and three bagels. Corned beef, pastrami, brisket and Swiss cheese with potato salad and coleslaw. Served with bread and choice of spread. Stuffing or mashed potatoes with gravy and vegetable. Stuffed derma. Served with gravy. Sour cream and applesauce. Side order - 2 pcs, half order - 4 pcs, full order - 8 pcs. Sour cream and preserves. Side order - 1 pc, full -3 pcs. Choice of meat, potato or kasha. Served with gravy. Served with sour cream and butter. Choice of 2: French fries, sweet potato fries, onion rings or fresh potato chips (regular or BBQ style). French fries, sweet potato fries, onion rings and fresh potato chips (regular or BBQ style). With cinnamon sugar, topped with vanilla ice cream and toasted coconut. Brownie topped with ice cream, whipped cream, hot fudge and nuts. Fresh fruit, ice cream, whipped cream, hot fudge and nuts. One Sandwich with one side of either Potato Salad or Coleslaw, Pickle, Condiments, one Orange, 2 Cookies and a cutlery kit.